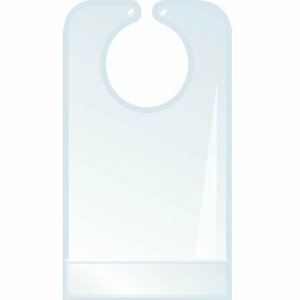 The Invisibib is a transparent, light weight, easy-to-use adult bib that protects your wardrobe with out affecting your style. Perfect for seniors, those with disabilities/physical challenges, even brides that need makeup touch-ups. CLEAR CLOTHING PROTECTER - One drop of anything can ruin an outfit instantly. Keep clothing clean and looking like new when eating anywhere. Keep one in the office, the car and even in a purse or briefcase. The clear material protects but does not stand out. The extra- long 33.5 inches of coverage works all the way to protect your lap from crumbs and spills. A pocket at the bottom catches crumbs. INGENIOUS DESIGN- Designed by a woman whose life changed after a severe accident. She saw the need for a lightweight, easy to use adult bib that protects your clothing discretely while not affecting your style. MULTIPLE USES- This bib is perfect for Seniors, Assisted Living facilities, those with disabilities, applying make-up, painting, washing small dogs, eating while driving, BBQ, or other messy activities. It is reusable, water-proof, adjustable hook and loop closure, and easy to clean. Just wipe with a damp cloth. DURABLE - Clear heavy gage PVC and wipeable surface is re-useable and with proper care can last for years. Ideal for use within the health service industry Wipes away clean with damp wash cloth. If you have any questions about this product by Richards, contact us by completing and submitting the form below. If you are looking for a specif part number, please include it with your message.